My aim for the next 4 weeks is to aim my training at 10k, with 2 core sessions a week nominally one around 10k pace and one around 5k pace. In my last blog entry I said I was heading away to the US for 10 days for work. I didn’t have the time or opportunity to erg while I was away, but did manage to run 3 times over the 10 days to maintain fitness. I have been training since I got home again, but have been lacking the time (as usual) to blog about it! Nothing special to write about anyway, so anyone that reads this hasn’t missed much! As I am going away for 10 days with work tomorrow to the US I wanted to have a fairly tough few training days in order to get some benefit while I have enforced rest for a few days now. 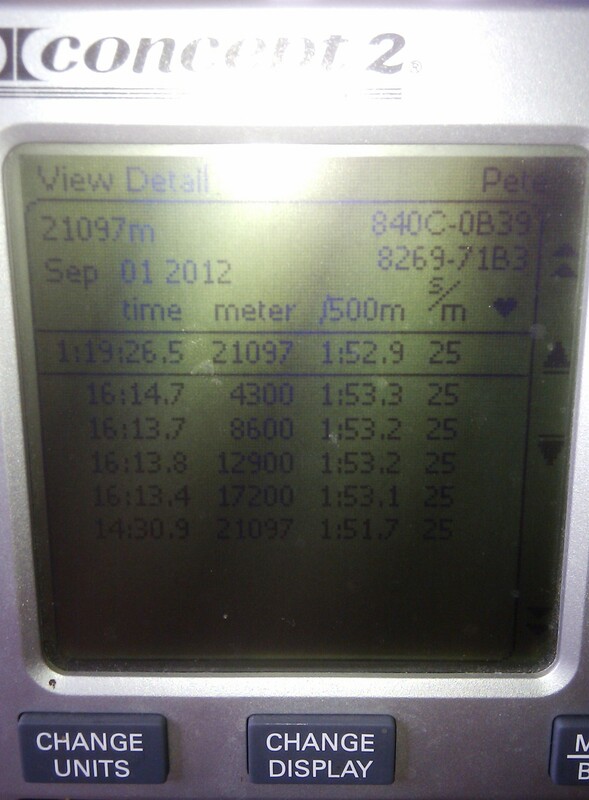 So a good final session to do before going away was my longest row in a long time, a half marathon. In order to motivate myself I picked a stiff target of getting to the top of the GB 2013 rankings for my age group, which required going under 81:05, or 1:54.6 pace. I set a target from this of breaking 80mins (it looks a lot quicker on paper) which is 1:53.7 pace, with an aim of simply keeping the average pace just under this right from the start. Although I like to row the second half a little quicker on long distance rows I don’t like to get to half way and have to row the second half quicker to make the target. Sub 80mins is always a good standard for a half marathon. Some way from my 74:36.5 pb, but I was right at peak fitness when I set that time.